Our Michigan personal injury lawyers represent clients who are injured by merchandise, pallets, and boxes that fall on them from store shelves and displays. Too often, store personnel stack boxes and products unsafely overhead that can fall on unsuspecting customers. These injuries occur in large box stores like Wal-Mart, Sam's Club, Costco, Home Depot, Lowes, Menards and other large retail stores. They also happen in department stores and other retail businesses. Can I Sue a Store if I am Hit by a Falling Box or Pallet? Under Michigan law, a storekeeper has a duty to provide reasonably safe place of business for its customers. The store is is liable for injuries resulting from unsafe conditions caused the negligence of the storekeeper or his or her employees.The injured person must prove either that the storekeeper caused the unsafe condition or that the storekeeper knew or should have known of the unsafe condition. This would include stacking boxes on overhead shelving that could fall unexpectedly and injure someone below. It is important to report the injury incident to the store manager or other store personnel immediately after the accident. Many times, the store manager will make a written report with important information about the accident. Also, the store manager will even take a photograph of the dangerous condition. If possible, you should take pictures as well with a smart phone camera. These things will all provide important evidence to support a legal claim filed at a later date. Serious injuries often result from falling merchandise, pallets, and boxes. Depending on the the type of products, the weight of these objects can exceed several hundred pounds, Even if only falling a short distance, the harm caused to the victim can be substantial. If an item is stack high up on the shelf and falls down, the injuries can be devastating. These injuries include closed head injuries, traumatic brain injuries, and spinal cord injuries. Several reported cases have killed the store customers. 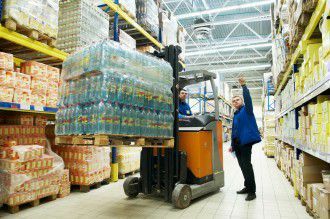 What Types of Compensation can I receive in a Falling Merchandise Lawsuit? A person injured by a falling object in a store can sue for different types of compensation. The first type, called non-economic, is for pain and suffering, fright and shock, disability, and similar type harm. The second type if for economic losses, which include lost wages and income, medical expenses and other monetary losses. In the even of a death, the surviving family members can file a wrongful death lawsuit. These cases seek compensation for the pain and suffering of the victim from the time of injury until death, the loss of society and companionship of family members, lost income and support, payment of medical expenses, and funeral expenses. Should I Speak with the Insurance Adjuster after my Injury Accident? The insurance company for the store may have an adjuster contact the injured customer as soon as possible after the accident before the injured person speaks with a lawyer.The adjuster is trained to get the injured person to say things that may later ruin their slip and fall case. Speaking to an adjuster before you hire a lawyer is a mistake for that reason. We strongly suggest that you contact our personal injury law firm before you speak to any insurance adjusters. WARNING: There are strict time deadlines for filing personal injury lawsuit claims, including for falling boxes, pallets, and merchandise.